Why all the drama over a Microsoft ad? Lauren, star of Microsoft's $1,000 laptop ad. First I saw PC World calling PC users losers . 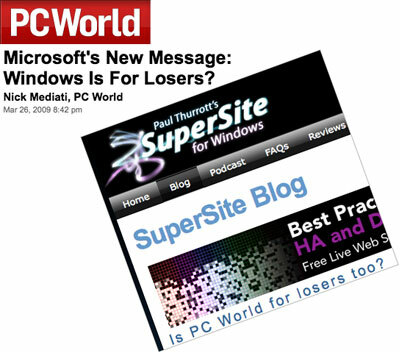 Next up is Paul Thurrott calling PC World losers. Does the madness end with the PC websites? No, there are plenty of Mac sites talking about this ad as well. The way I see it, debating the meaning of a commercial is like answering a rhetorical question. It shows that you didn't get it. It doesn't mater if Lauren is a "real person" or an actress. Who cares if the PC she picked was a piece of crap. Does saying I'm "not cool enough for Mac" imply that PC users are losers? Probably not. Do Mac owners suddenly have to defend their purchasing choices? No, it's just a commercial. Microsoft doesn't give a damn how much the computer you buy costs - as long as you bought it with some version of Windows. If you want to buy a crappy $400 laptop or a $3,000 workstation, either is fine with Microsoft, just so long as it has a legal install of Windows. The more interesting question is why this ad at this time. Last time I check, Apple's most recent "Get a Mac" ad was at Christmas time. These were both lighthearted ads with only a subtle sales pitch. Why would Microsoft launch an attack ad three months later? Aren't they supposed to be spending their ad dollars hyping Windows 7? 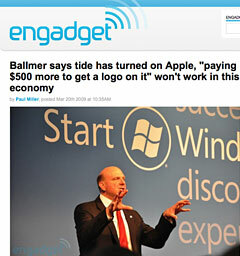 Steve Ballmer was recently quoted as saying the tide is turning on Apple - the economy makes it hard for people "paying $500 more to get a logo on it?" While this is a great headline, I think Ballmer was mostly interested in the possibility that Apple has lost some momentum. The best time for a strong play is when the other team losses its momentum. Ballmer is hoping for a fumble so Microsoft can carry the ball. Microsoft is trying to play up the weakness in sales at Apple as much as possible to slow down Apple's growth. This is funny, because all Windows FUD likes to trash Apple for how small and unimportant Macs are in the market, yet we have Microsoft clearly going after Apple. If the Mac's market share is so small, why spend the money on ads to compete with the underdog? The truth is that Microsoft is threatened by Apple. So far Apple has crushed Microsoft in the music business, taken over a large share of the smart phone market, and is arguably selling the better operating system. That's a few too many wins under Apple's belt, and success breeds envy. Microsoft's biggest worry today is that Windows 7 will not be a huge success - or worse, to have success sucked away with endless comparisons to Mac OS X 10.6 "Snow Leopard". Microsoft sees the need to generate as much bad publicity for Apple and the Mac as it can ahead of the Windows 7 launch. Clearly Ballmer's comments and this ad are trying to promote the perception that Macs are expensive and discourage sales of these "high priced" computers. The other funny thing is I am a Mac user who has both Microsoft Office and Windows Vista installed on my Mac. If I was easily offended, Microsoft might have lost me as a customer because of this ad. I know better, and I understand that any extra money bought more than just a logo. Good luck to all of those furiously debating the meaning or implications of a commercial. Maybe you all could help me solve another puzzle: Which came first the chicken or the egg?